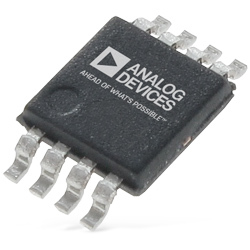 Analog Devices LTC2879X RS485/RS422 transceivers are rugged transceivers that display a maximum of 20Mbps baud rate. These transceivers feature low-drift and low-leakage circuitry. The transceivers provide fully balanced differential receiver thresholds with 240mV hysteresis for higher noise tolerance and low duty cycle distortion. These transceivers are defended from overvoltage line faults for up to ±60V making LTC2879X RS485/RS422 transceivers particularly robust and ideal for harsh environments. The transceivers also satisfy the specifications for PROFIBUS-DP (IEC 61158-2) that support all data rates. The transceivers are designed to operate over a wide temperature range of -55C to 175C. These transceivers are fully tested to meet critical specifications at 175C. The receivers of these transceivers are failsafe for open, shorted, and terminated conditions that result in improved data communication reliability in noisy systems. The RS485/RS422 transceivers come in small 3mm x 3mm MSOP package. Typical applications include high-temperature industrial control, oil and gas exploration, PROFIBUS-DP, and defence systems.